Rauðfeldsgjá (Red-cloak rift) is a deep rift which extents about 40 meters into the mountain Botnsfjall in Snæfellsnes. You can enter it but be prepared to do a bit of climbing. Also take real good care because a small brook runs through it and you will probably get soaked. Rainwear and boots or waterproof shoes are a must. The moisture also makes everything slippery and it’s very easy to fall and hurt yourself badly if you’re not extra careful. I’ve seen it happen and the nearest doctor is a long drive away. 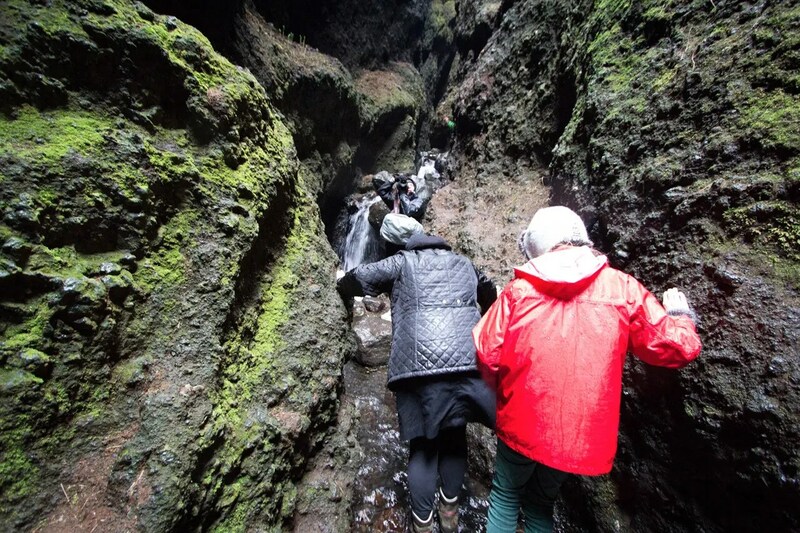 Rauðfeldsgjá is a natural phenomena and if you’re able and willing you can make your way until you reach a small waterfall. It’s quite the place let me tell you. There is a rope there should you like to venture further but for most people finding the waterfall is enough. According to the old legends Bárður Snæfellsás, a half troll and half human, pushed his nephew Rauðfeldur (Red-cloak) into the rift after the latter pushed Bárður’s daughter Helga to sea on an iceberg. After this Bárður vanished into the Snæfellsjökull glacier never to be seen again alive. Incidently the iceberg drifted all the way to Greenland where Helga found herself a lover.